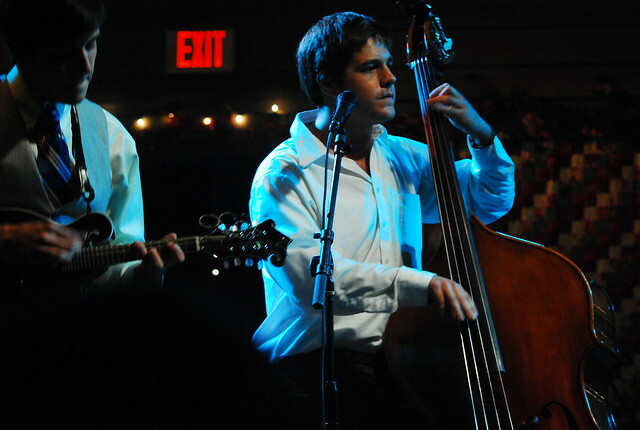 Bands from North Carolina with upright basses and banjos and mandolins draw, fairly or unfairly, comparisons to one of two bands, at first: the Avett Brothers, or Chatham County Line. Either the Avetts’ high energy stage show, or Chatham County Line’s cluster around a single microphone and close harmonies. Music writers can’t help themselves when they want a point of comparison to jump start a review. We can’t; I’m sorry. So instead of telling you why Mipso isn’t like the Avetts or CCL, I can tell you that when I interviewed them almost two years ago, we all crowded around a small table at an already crowded Weaver Street Market cafe, and they were charming and earnest, and if Jacob Sharp had a time machine, he’d really like to see Flatt and Scruggs tour Japan in 1969. I love that interview question because it’s almost more revealing that asking a musician or artist to reveal their deepest secret. The Avetts and Chatham County Line aren’t the only bluegrass musicians to come through North Carolina, or come from North Carolina; they weren’t the first, and Mipso won’t be the last, but with Dark Holler Pop, Mipso has put their own stamp on a genre, a “sound”, that’s come to describe this state. In case you are not from the South and don’t watch Justified, a “holler” is, according to Merriam Webster, a chiefly dialect variant of hollow; what that means in the South is that sort of tiny valley in the hills and mountains, not a valley proper, but something hidden, something secret. It’s an appropriate title for a record that’s full of tiny, surprising, intimate moments, and also full of smart pop song songwriting. Pop songwriting is different, for me, than rock and roll songwriting — not in a bad way, but in a subtle way. A tiny level more care for choruses, maybe; good songwriting is always good songwriting. But Mipso has that tiny separation between pop and rock songwriting that makes the last word of the title appropriate: Dark Holler Pop is an album about small, careful, dark-but-not-morbid secrets, all put out in sharp bluegrass pop songs. Album opener “A Couple Acres Greener” has a Beach Boys feeling, the picking and mandolin that precedes the first verse lending the song a California sunshine pop feel, which Mipso combines with the regrets of Southerners and 20-somethings in a fucked up, increasingly corporate world; it’s an ode to hollers, the places where people still live off and with the land, and the chorus implores the listener to just leave the world ” just a couple acres greener when I go”. “Tried Too Hard” carries the earnest regrets of the 20-something (I know those regrets well, and still have them as a 30-something), and the mournful fiddle line echoes the not-quite-remorse in the lyrics, a line that says it’s not exactly regrets if the choices get you where you want to go. “Louise” is the kind of warm and intimate love song about escape and youth that truly is straight out of some of North Carolina’s mountain hollers; a song about luck and the ways that broken things still have value. I think that one of the strengths in Mipso’s music is their fantastic use of three part harmonies, in an old fashioned Appalachian kind of way, even when the rest of the song doesn’t sound like that; it’s evident in the forefront of “Rocking Chair Blues”, which is so otherwise quiet — low-picked guitar and mournful fiddle line — that the harmonized choruses feel enormously loud in comparison, and powerful. “Red Eye To Raleigh” aches and twangs like a Laurel Canyon Gram Parsons song, and emphasizes their harmonies on the i remember your parting shot in a parking lot chorus lines. The record finishes strong with “Carolina Calling” and the almost eerie fade-out of “Do You Want Me?”, which is my favorite track on the album; Mipso has, here, fired an opening shot across the bow of the Great Ship Of Avett Brothers Comparisons, and while they’re inevitable, I think that Mipso is going to ford their on path, starting here.